At the IAA Commercial Vehicles Fair in Hannover (September 23 to 30, 2010) Opel debuts a research project on a Vivaro e-Concept, an electric van with up to 400 kilometers extended range. With this concept, Opel imagines that environmentally friendly e-mobility could also be intriguing for commercial vehicle operators. "We would like to test the acceptance of our advanced propulsion technology by showing the Vivaro e-Concept to the commercial vehicle specialists attending the show," says Chris Lacey, Executive Director, International Operations Opel/Vauxhall Commercial Vehicles. 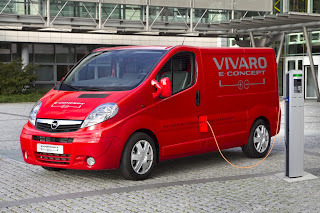 "We are convinced that we will get a fantastic reaction from the people who use such vehicles on a daily basis: Electric mobility will allow them to travel in city areas which are now off-limits to petrol and diesel-powered vehicles and the range-extender technology makes it possible to use an electric van for normal routine business." The 111 kW electric motor in the Vivaro e-Concept propulsion system delivers 370Nm of torque and would offer 100 kilometers pure electric driving range. On longer, regional hauls or shuttle services, range-extender switches on, extending the total driving range to more than 400 kilometers. Thanks to Opel's extended range propulsion concept, engineers foresee the Vivaro e-Concept as capable of driving permanently with engine and electric motor propulsion, enabling drivers to reach distant destinations with the confidence and peace of mind that a depleted battery will not strand them.